One wrestler said Jordan, a former assistant coach at Ohio State, took part in locker-room conversations where athletes discussed the abuse. 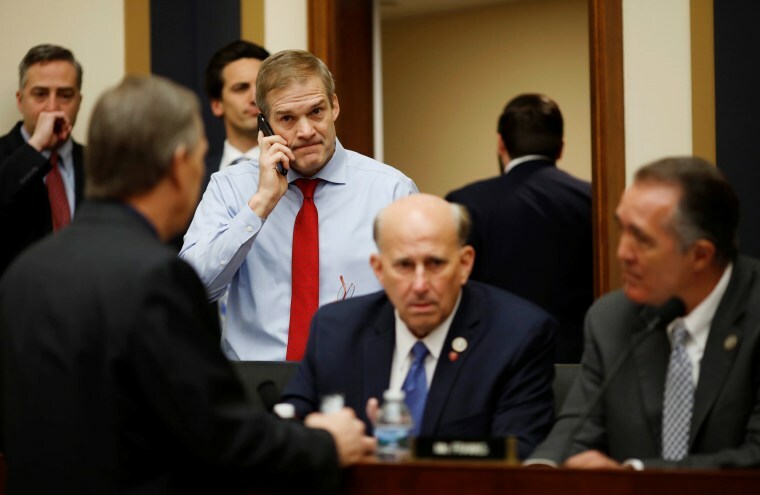 More former Ohio State University wrestlers have come forward to contradict Rep. Jim Jordan’s claim that he had no idea the wrestling team doctor was molesting athletes. One of the wrestlers, Shawn Dailey, said he was groped half a dozen times by Dr. Richard Strauss in the mid-1990s, when Jordan was the assistant wrestling coach. Dailey said he was too embarrassed to report the abuse directly to Jordan at the time, but he said Jordan took part in conversations where Strauss' abuse of many other team members came up. Dailey spoke out two days after NBC News reported that three former wrestlers who were coached by Jordan more than two decades ago accused the GOP congressman of turning a blind eye to Strauss' alleged abuse and then lying about it. Jordan denied knowing anything about the abuse and continues to do so. "Dunyasha comes back and tells Jimmy, ‘Seriously, why do I have to pull down my pants for a thumb injury?’" Dailey recalled. "Jimmy said something to the extent of, ‘If he tried that with me, I would kill him.'" “What happened drove me out of the sport,” said Dailey, a married father of two who works as a fundraiser for an Ohio college. “So I was surprised to hear Jim say that he knew nothing about it." Also Thursday, Mark Coleman, another former wrestler and a former UFC world champion, told The Wall Street Journal that Jordan was aware of the abuse and had not taken action. “There’s no way unless he’s got dementia or something that he’s got no recollection of what was going on at Ohio State,” said Coleman, who said he was Jordan's roommate on several wrestling trips. Fury did not immediately respond to a request for comment on Thursday after Dailey's remarks. But Jordan got a shoutout of support from President Donald Trump, who spoke to reporters Thursday on Air Force One. Strauss died of suicide in 2005. The university opened an investigation into the abuse in April after former Ohio State wrestler Mike DiSabato came forward with allegations. Yetts and two other former Ohio State wrestlers previously told NBC News that it was common knowledge that Strauss showered regularly with the students and inappropriately touched them during appointments. Yetts, who served 18 months in prison for stealing nearly $2 million from investors, was the only wrestler who said he had directly reported the abuse to Jordan, but all three wrestlers said it would have been impossible for Jordan to be unaware of the abuse. Hellickson, the former coach and Jordan's mentor, said in a recent video — made by DiSabato — that he had told Strauss that he was being too "hands on” with students. The Perkins Coie investigators are in possession of that video, DiSabato said. Fox News reported Thursday that Jordan has received what he described as threatening emails from DiSabato, including one that landed in his inbox early on Wednesday and was “the last straw.” Jordan forwarded the emails to the U.S. Capitol Police, which is reviewing them, Fox reported. NBC News has reached out to the Capitol Police but has not confirmed the report. Dailey said that after he left the team in 1996, he underwent counseling to deal with what happened.